Disabled parking in the small lot (access from Alder) at the SE corner of the building. Regular parking on the track field, access from 25th between Cherry and Alder. Free! Open to Everyone! No Reservations Required! 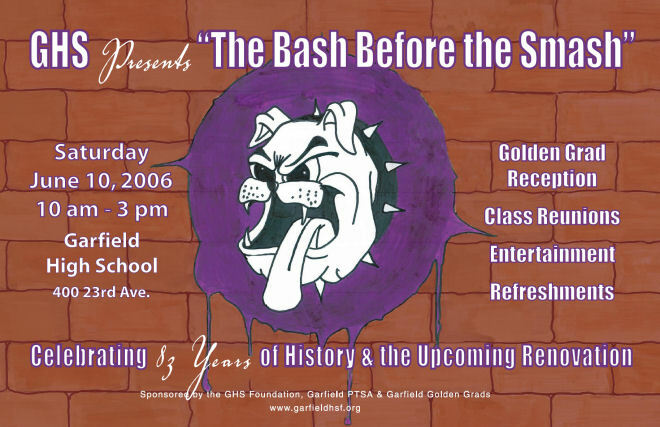 Join alumni, students, teachers and community members and celebrate 83 years of history and kick-off the two year renovation of Garfield: Mini Class Reunions, Refreshments, Musical Entertainment, and souvenirs for sale. Buy a Bulldog Brick! Sponsors: Garfield PTSA, Garfield Golden Grads, GHSF. Garfield High School will undergo a $70+ million renovation in 2006-2008. 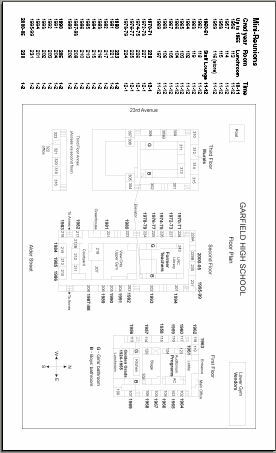 Visit the Garfield School Design Team website to see pictures, floor plans, and more! 1p-2p 204 1991 Please volunteer! 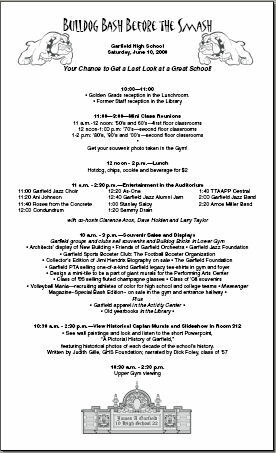 Garfield's long tradition of musical talent will be tested at the Bash before the Smash when current and former Bulldogs -- spanning five decades -- take the stage in Quincy Jones Auditorium. Everyone in attendance will find a familiar face, from Stanley Saloy, who mopped the floors at the basketball games, to Sammy Drain, who rocked out with Jimi Hendrix, to the more modern day jazz sounds of David Marriott and Ani Johnson to the current GHS Jazz band, As-One and Conundrum. Also in attendence is Roses from the Concrete, the GHS Jazz Choir and TTAAPP Central. The Master of Ceremonies leading the show will be the infamous Jazz band leader Clarence Acox. The final act, brought to you by Amos Miller, will welcome all the above artists to the stage for one big finale jam session. Last updated Sunday, January 24th, 2010.